Kettle Brand certainly keep it simple. And so shall we. Color coded bags. Colors associated with the flavor. Minimalist design. Plain but fairly ideal for marketing purposes. The split color bag works well with the green strap-line to make its point. 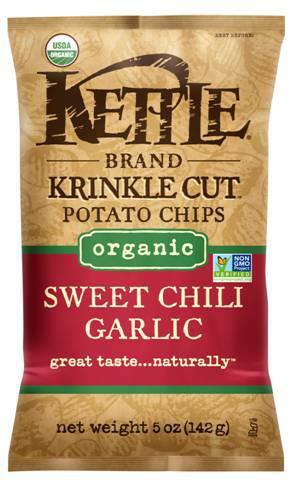 However, we don't much like the background Krinkle Cut Chips images; no additional fuss was required for this otherwise very good bag design. The lightly dusted powder did not dampen down what was a loud and proud crunch. The Ridged nature of the chips provided a robust and hearty snap and crackle to an already sturdily made Chip. More like eating food than a snack, especially when dunked in dip. These Ridged Chips were wide and thick. There were very few signs of oil bubbling and heat frying. There was the odd brownish blemish and some skin visible, but not much. The seasoning powder was flecky and gave the Chips a sort of coating that transferred to eager fingers. A syrupy sweet tangy tomato based flavor provided the background to a gentle but influential heat. The garlic powders presumably enhanced the flavor of what was a very mildly hot, but sweet tasting Chip. A really good balance of flavors.